In a medium bowl, whisk together flour, baking powder, cinnamon and salt. Pour in milk, egg and mix until combined. Heat up a nonstick pan over medium heat. Lightly coat with butter or canola oil. 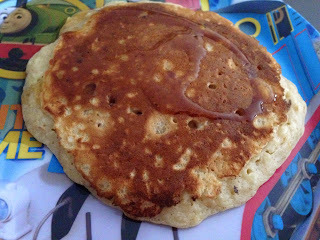 Pour about 1/4 cup of batter into the pan and cook until edges look dry and bubbles appear on the surface of the pancake. Flip and cook the other side. Repeat with remaining batter, lightly coating the pan with butter or oil between each pancake. Serve with maple syrup and coffee or milk.